Last week, PJ and I saw four plays while we were in New York City: Finian’s Rainbow, South Pacific, The Understudy, and God of Carnage. None of them knocked our socks off, but I enjoyed the musicals a lot and we were both pleasantly surprised by The Understudy. We arrived in New York on Tuesday. We didn’t buy advance tickets in case our flight was delayed or something like that happened. SO, after we checked into our hotel we went to the TKTS booth for discount tickets. We did this last year and were really happy with the tickets we got for In the Heights. Also like last year, we had nothing in mind for the Tuesday night show. We just knew we wanted to see a musical. If there had been tickets for it, we probably would have seen A Little Night Music starring Catherine Zeta-Jones and Angela Lansbury, but that wasn’t available. One of the options PJ suggested was Finian’s Rainbow, which we knew almost nothing about. The only thing we knew was, as PJ pointed out, Cheyenne Jackson was in it. That seemed more tempting to me than the other alternative PJ suggested, Hair. I intend to write more about Mr. Jackson in another blog later this week, so I’ll save some of my thoughts about him for that. For this post, I’ll just start by saying that this was our chance to see him in person, and I was going to take it unless PJ insisted on Hair. He didn’t. 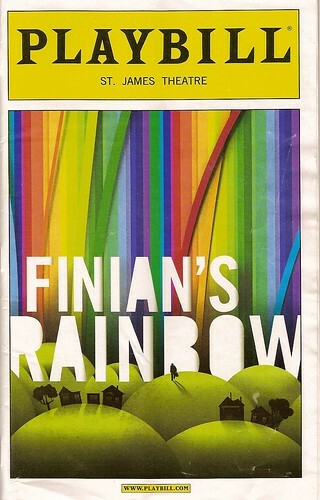 So, we got out tickets for Finian’s Rainbow. Overall, it’s kind of lightweight even for a musical. It originally ran in 1947. The plot revolves around Finian, an Irishman who moves from Ireland to the mythical state of Missitucky with his daughter, Sharon. Sharon soon catches the eye of Woody, who is leading an effort to combat the racist policies of Senator Rawlins. We soon learn that Finian has stolen a pot of gold from a leprechaun, Og, who wants his gold back. Comic mayhem ensues. Finally, Finian is played by Jim Norton, who starred in and won a Tony for The Seafarer, in which he was hilarious. He’s equally funny in this role. Overall, I’d say Finian’s Rainbow is a pleasant show that features big talents. I enjoyed it and haven’t been able to stop singing some of the songs since. It’s not the greatest musical ever written, but these performers make it a worthwhile evening of entertainment.